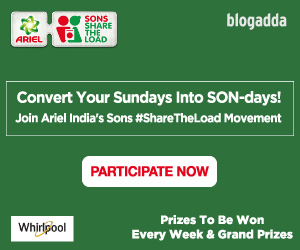 Since we love you so much, let us also throw in some fun filled activities which have exciting goodies to offer and yes gift hampers for all bloggers. Oh, yes we like the fact that now you are on the edge of your seat, ready to run the moment we tell you when and where! Bangalore, did we not promise you that we shall soon hit your known roads and bring to you a culinary world experience that you will hate to miss! 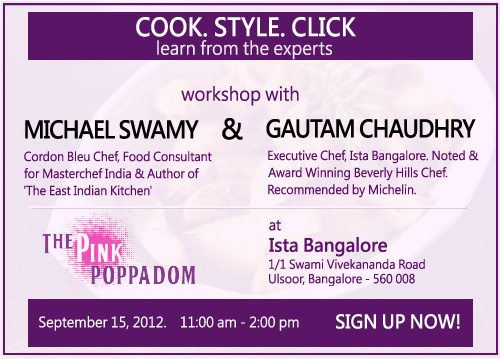 Presenting BlogAdda’s latest food workshop with Pink Poppadom, Bangalore – led by celebrity chef Michael Swamy and executive chef, Gautam Chaudhry, Pink Poppadom. Over three hours in a fun filled afternoon, Michael and his team will teach you nuances about culinary skills, details about food styling and yes on hands food photography session by the pro himself. Michael is to teach you cuisines that are his favourite, detailing out ingredients, techniques and yes giving his special Master Chef tips exclusively for our BlogAdda bloggers. Gautam shall not be too far, for he shall teach you to dish a few popular dishes of his restaurant. Those perfect dishes which you drooled over on your TV screens – Learn them all here. We know that the food should seduce you to beckon your taste buds and gastronomical juices. Thus, the masters shall teach you how to plate it the fashionable way that makes the dish looks irresistible. How to wipe that dish with a swipe or how to add those strawberries in the most alluring fashion? – Learn it all here. 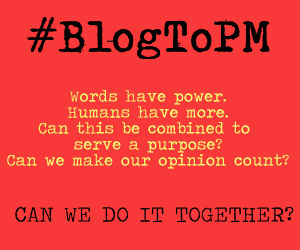 Of course we will allow cameras and in fact we shall ask you to do more than just bring them along. For, we have with us a chef whose mother is a noted documentary film maker and who has grown up with cameras. Doesn’t he have the most perfect supplementing skills? So learn from Michael Swamy the tips and tricks about food photography – the angle, the light, the settings, the zoom, the blur – Learn it all here. Okay, okay we are telling you how to sign up, kindly remain calm and do not slam your keyboards! 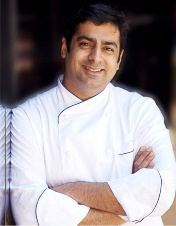 Chef Gautam Chaudhry has had a globetrotting career. This is one of the reasons that his global yet local cuisine style received recommendation by Michelin (the internationally acclaimed platform that recognizes and rewards masters in the field of Culinary Arts, for innovativeness and flavors of the food. Chef Gautam started his career in the hospitality industry with Radisson hotels , followed by “The Oberoi, New Delhi” where he took the Indian Cuisine to the next level. Post this he moved to Beverly Hills, USA as an Executive Chef for the “Tanzore Restaurant” and was instrumental in conceptualizing and managing the restaurant while reshaping it as one of the best Indian Restaurants in the country which then became famous for the innovativeness and flavors of the food. Within two years, Chef Gautam, established himself as one of the Beverly Hills most acclaimed Chef’s and had received numerous awards & accolades. After a successful stint in USA, back in India took up the role of Executive Chef at Radisson Hotel, Pune. 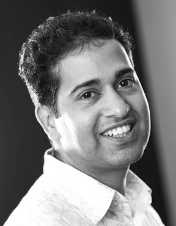 Prior to joining Ista Bangalore as the Executive Chef, he had served Ista Hyderabad in the similar capacity. At Ista, Bangalore, he conceptualized and was part of the core team that opened , “The Pink Poppadom” restaurant , where he reshaped the perception of Indian Cuisine, with his boldly flavored, contemporary cooking. Chef Gautam has many laurels to his credit, from representing “Radisson Hotel Delhi” in an Indian food promotion at “Mandarin Oriental Hotel Du Rhone, Geneva” to looking after the operations of Radisson Hotels Worldwide (RHW) to holding the position of a “Sous Chef”, Indian Cuisine, at The Oberoi, New Delhi. Chef Gautam is an adventure sports enthusiast and enjoys outdoor treks during his leisure time. My expereince at the workshop..